Amy Norway, the lead sales and service clerk at Lima’s downtown post office, helps customer Diana Croteau, of Lima, mail out Christmas packages Friday morning. LIMA — Retailers aren’t the only ones feeling the holiday rush. The U.S. Postal Service expects to deliver nearly 15 billion pieces of mail and 900 million packages between now and New Year’s Day, according to USPS Regional Spokesperson David Van Allen. “This is our busiest time of the season, and we call it our peak season because of the amount of packages we deliver to homes and businesses,” Van Allen said. People who want to mail packages to troops overseas should do so by Dec. 11 for priority and first class mail. If a person goes past that day, they have until Dec. 16 to mail packages priority mail express for troops overseas. Those who want to send out packages by ground mail have until Dec. 14. To send out cards and letters, you have until Dec. 19. The deadline to guarantee delivery by Christmas for priority mail Dec. 20, and it’s Dec. 22 for priority mail express. The USPS hires extra employees this time of year and works diligently to make sure everyone receives their holiday packages on time, Van Allen said. The postal service already delivers packages on Sundays in major cities and anticipates delivering more than 6 million packages on Sundays in December, according to Van Allen. 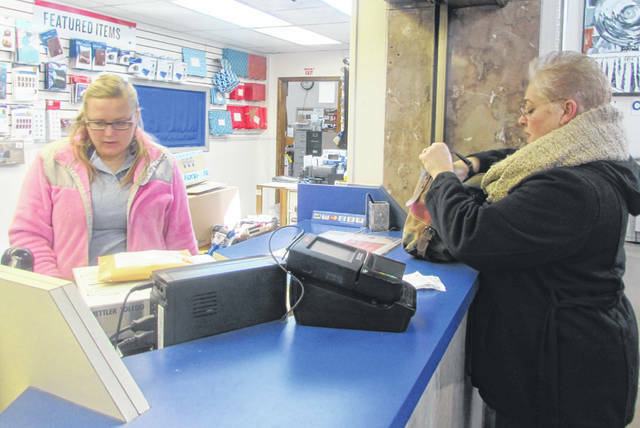 The Lima, Findlay and Celina post offices will be open from 9 a.m. to 2 p.m. Sunday, Dec. 16. “We are hoping to make shipping during the holidays as convenient as possible,” said Celina Postmaster Paul Joseph. The week of Dec. 17 to 23 is predicted to be the busiest mailing, shipping and delivery week, when nearly 3 billion pieces of first class mail including greeting cards will be processed and delivered, according to USPS. Diana Croteau, of Lima, stood in line at Lima Post office Friday morning with Christmas packages to mail out. “I have customer orders for my business where I make blankets and pillowcases that people give as gifts,” Croteau said. She likes to beat the rush and mail out her orders and has been mailing out the items for the past 10 years. Consumers don’t need to leave home to ship their packages. They can visit usps.com. The postal service anticipates Dec. 17 to be the busiest day online, with more than 8 million consumers predicted to use the site to help ship holiday gifts. It’s also estimated nearly 400,000 consumers will us the click-n-ship feature and other online services on Dec. 17 to order free priority mail boxes, print shipping labels, purchase postage and even request free next day package pickup. Customers are advised to not leave delivered mail and packages unattended. If you’re going out of town, hold mail at a local post office.